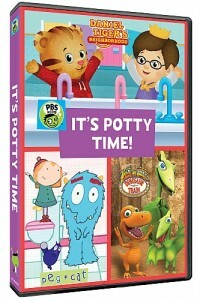 In the It’s Potty Time DVD come along as Prince Wednesday learns how important it is to stop and go potty right away in a story from Daniel Tiger’s Neighborhood, while in an episode of Peg + Cat, Peg and Cat show Big Mouth the six steps of going potty. A story from Dinosaur Train in which Buddy and Tiny discover that “all creatures poop,” even really big dinosaurs, is also included. Prince Wednesday is in the block corner at school, building the “tallest tower in the world!” Even though he needs to go to the bathroom, he doesn’t want to stop what he is doing. He learns how important it is to stop and go right away. Dad’s trumpet is broken, so he takes Daniel along to Music Man Stan’s Shop to get it fixed. While at the shop, Daniel needs to use the bathroom, but thinks he will have to wait until they get home. Music Man Stan explains that everyone goes to the bathroom, and Daniel learns that he can use the bathroom there – or anywhere else in the neighborhood! Peg and Cat must teach Big Mouth the 6 steps for making on the potty, or his visit to Viv’s house will be ruined – as will Viv’s carpet!